What is the x-coordinate ? Definition and examples. The x-coordinate of a point is the first number in an ordered pair. 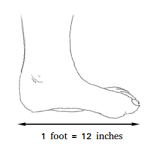 It indicates a distance along the x-axis or horizontal axis in the coordinate system. For the point (3, 4), the x-coordinate is 3. This means that the distance along the horizontal axis is 3. For the point (-5, 1), the x-coordinate is -5. The distance along the horizontal axis is 5 and it is still a positive number. However, notice that this time, the point is in the second quadrant. The x-coordinate can either be positive or negative. The x-coordinate is positive in the first and fourth quadrant and negative in the second and third quadrant. 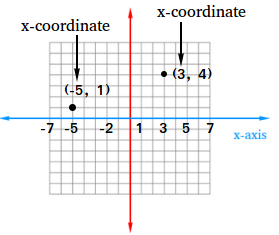 The x-coordinate is called x-value when dealing with functions.